To compliment our superb range of tyres, we also supply an extensive range of wheels for most 4x4 vehicles. We carry wheels in stock for Land Rover, Jeep and most Japanese 4x4s. Before mounting a set of aftermarket wheels, there are some dynamics involved with fitment that are best to understand first. 1. Wheel Diameter. This is the diameter of the wheel. Stock wheels are commonly 15 or 16 inch diameter. This dimension is usually in 1 increments (i.e. 15, 16, 17) but some manufacturers offer 16.5, which is rare. 3. Wheel Center. This is the center of the wheel in relation to the width. 4. Offset. 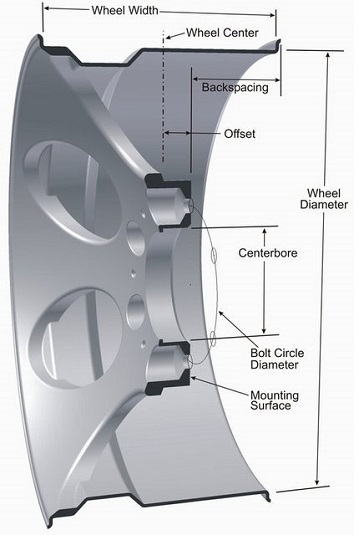 The distance from the centerline of the wheel to the face of the mounting surface of the wheel that contacts the hub. 4.1 Zero Offset. Indicates the mounting surface is at the wheel center. 4.3 Positive Offset. Indicates the mounting surface is in front of (or outboard) the centerline of the rim. This is often found on front-wheel-drive vehicles. Stock Tacoma wheels have Positive offset. 5. Backspacing. The distance from the mounting surface to the inside lip of the wheel. This measurement is closely related to offset (without actually measuring, backspacing is about equal to [Wheel Width / 2] + [Offset] + [about 1/4] ). 6. Centerbore. The centerbore of a wheel is the size of the machined hole on the back of the wheel that centers the wheel properly on the hub of the car. This hole is machined to exactly match the hub so the wheels are precisely positioned, minimizing the chance of a vibration. This measurement may be critical to clear the hubs of a 4WD. 7. Bolt Circle. Also known as PCD (Pattern Circle Diameter). The bolt circle represents the diameter of an imaginary circle that goes through the center of the bolt holes. 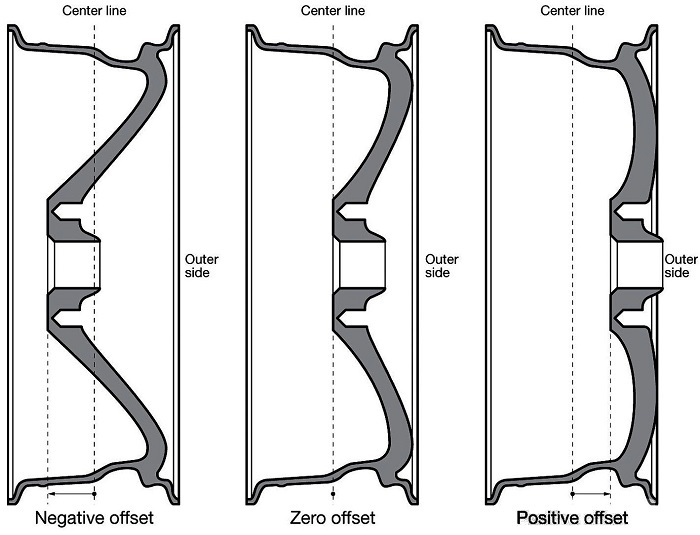 4x2 Tacoma Bolt Circle: 5 lug on 4.5 PCD; 4x4/Prerunner Tacoma Bolt Circle: 6 lug on 5.5 PCD.